VIENNA, Austria - Sept. 12, 2017 - PRLog -- From an iconic singing competition that became the staple of every Philippine household's afternoon radio listening and eventually TV viewing for almost decades since 1953, "Tawag ng Tanghalan (Call of the Stage)" continues its symphony as the Philippines' all-time favorite search for outstanding amateur talent, to date. As the latest revival at top-rating variety show "It's Showtime" continues the tradition of providing the platform for singers with nary a professional exposure but with a gamut of talent, ABS-CBN and The Filipino Channel (TFC) takes it even further as they bring the tour de force that is Tawag ng Tangalan globally. After a good turnout of Filipino amateur singers who could very well be professional performers themselves, at the launches in June in North America, Asia and Europe, anticipation is high this quarter as the region finals begin, starting in Europe this September 17 at the Halle E + G MuseumsQuartier, Museumsplatz 1, 1070 Wien, Austria. Bernardite Steiger and Louise Denciv Auman from Wien Austria and Annabel Hernandez, Rinnalyn Silang and Geraldine Marsak-Lopez from Vienna, Austria; Marnelli Oliva from Paris, France; Alexandra Yatco of Varby Gard, Sweden; Marlita Schon of Stockhom, Sweden; and Joy Bautista and Arnold Soria of Madrid, Spain. 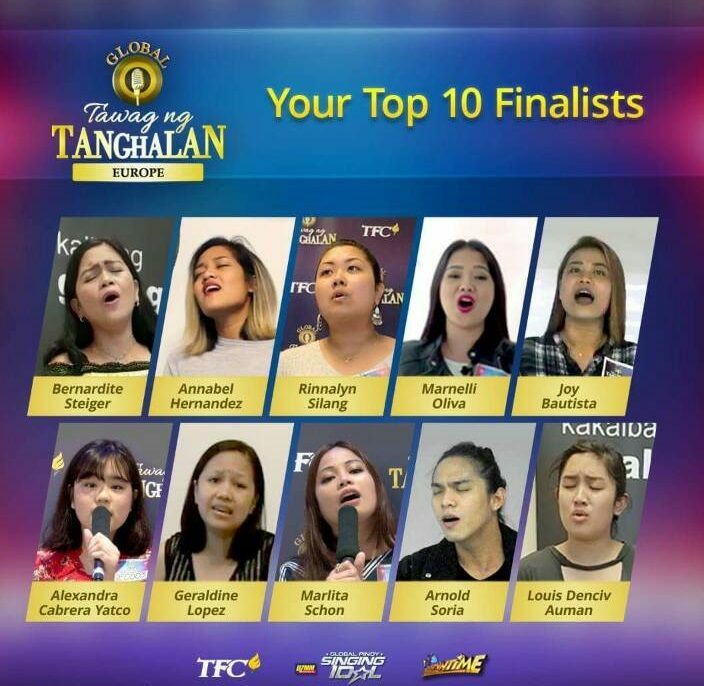 Known for the Filipino wealth in talent and this line-up, both judges and voters will face the toughest challenge yet --- identify who will be the first Global Tawag ng Tanghalan representatives from Europe. These contestants face the challenge of becoming the first global representative and the second grand champion following the footsteps of Tawag ng Tanghalan greats that include Superstar Nora Aunor, Perry Como of the Philippines Diomedes Maturan and director Bobot Mortiz. Judges include ABS-CBN Integrated News Head Ging Reyes; Toolstation Chief Finance Officer Alfonso Pinto and ABS-CBN Europe Ltd. Officer-in-Charge (OIC) Luis Bariuan. Two winners will be declared winners and will flown in to represent Europe and compete with other regional finalists in the global showdown happening at the "It's Showtime" studios in Manila on December 2017. Meantime, paying tribute to the Filipino talents are two iconic artists: Rockoustic Princess and Tawag ng Tanghalan sa It's Showtime hurado (judge) Yeng Constantino and multi-faceted actor, athlete and singer Matteo Guidicelli, in song. Filipinos who wish to show their support for their kababayans can get the tickets from the following: FORTEPINO At Your Service from Aries Fortuna at telephone no. ‎06763573492; Andrea Dano Gomes with tel. no. +436764667844; Pinoyloading from Schellhammergasse 22; Adel Calanog at tel. no. 0676 56 11162; Sunshine Hair Salon at Heine Strasse 42 1020 Vienna in Austria and with tel. no. +43 5322653; and Marizel Rojas via + 43 699 14596190. VIP ticket holders can get a chance to have a photo opportunity with the celebrity guests and join the pre-event cocktails with surprise guests. Tickets are at € 50 while General Admission is at and € 25. Gates open at 1 p.m. and the show starts at 3 p.m.
Watch out for the other other region finals in other continents: October 14 at the Thomas and Mack Center in Las Vegas; November 3 via the One Music Experience (1MX) at the Dubai Ampitheater in the Middle East and this 4th quarter in Asia Pacific. For more information on Global Tawag ng Tanghalan regional finals in Europevisit emea.kapamilya.com or facebook.com/TFCEurope. Connect with fellow global Kapamilyas and follow KapamilyaTFC and KapamilyaGlobalPR on Twitter and Instagram.